How have mode shares of journeys to work from different home locations in Sydney changed between 2006 and 2011? What has the impact been of the new T-Ways and the Epping-Chatswood railway? In my recent post on city level mode share changes we saw that Sydney had a 2.1% mode shift to public transport between 2006 and 2011. This post will uncover which areas shifted the most. For more analysis of patterns in the 2006 journey to work, see an earlier post. The following animations show various mode shares for journeys to work from Census Collection Districts for 2006 and Statistical Area Level 1 (SA1) for 2011, with a minimum density of 3 workers travelled per hectare. These are the smallest geographies available for each census. All the data is by place of usual residence. I’ve animated each image to alternate between 2006 and 2011, so you can gaze at them and spot the changes. You’ll need to click on them to enlarge and see the animation. A shift to public transport is particularly evident in the north-western suburbs between Blacktown, Castle Hill and Epping. This is like to be a result of the new T-Ways (busways) between Parramatta, Blacktown and Rouse Hill, and express bus services from the area to the city along bus lanes on the M2 motorway. There is also some evidence of mode shift along the Cronulla rail line. Many new patches of green appear in the 2011 map which were blank in the 2006 map. I’m not sure if these are a result of the changed ABS geography (CD to SA1), or new transit orientated developments (I suspect mostly the former). This map excludes those who used private transport to reach public transport. As well as the above public transport shifts, shifts to sustainable transport are evident around Turramurra and Forestville in the northern suburbs. Areas with a noticeable shift to train include Hornsby, Quakers Hill and Epping. There is little change evident around the new Epping-Chatswood rail line, other than for a small residential pocket near Macquarie University station. Most of the stations on the new line are surrounded by non-residential land uses and show up as white. There has been quite a substantial impact on the public transport share of journeys to workplaces along the new line, which you’ll see in an upcoming post. 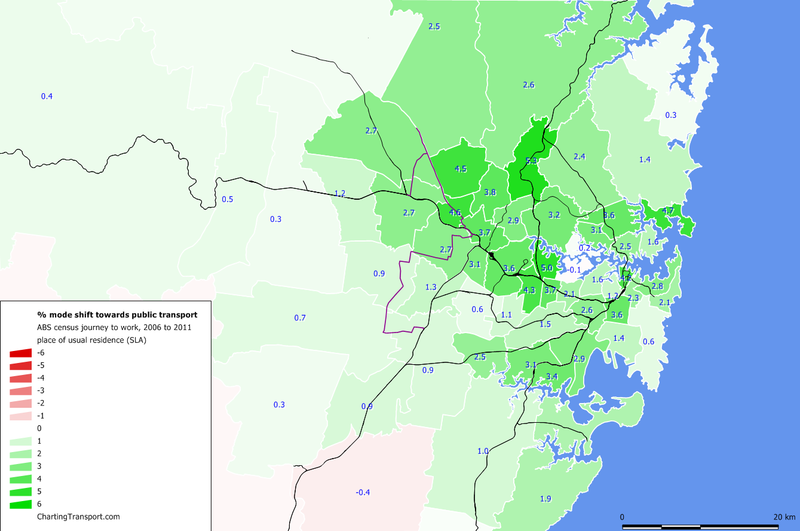 A shift to bus is most evident in the region between Parramatta and Castle Hill (as mentioned above). Shifts to ferry are most evident around Manly, Balmain, and Watsons Bay (which is a little odd as it does not have peak period services). 43,815 people in Greater Sydney travelled to work by train and bus (and no other modes except walking) in 2011, up from 34,377 in 2006. Journeys involving train and bus remain most heavily concentrated around Bondi Beach, where special cheap integrated train/bus link tickets are available. Areas with some shift to train and bus travel include Epping, south of Blacktown, Bossley and St Johns Park (served by the Liverpool-Parramatta T-way), and North Parramatta. 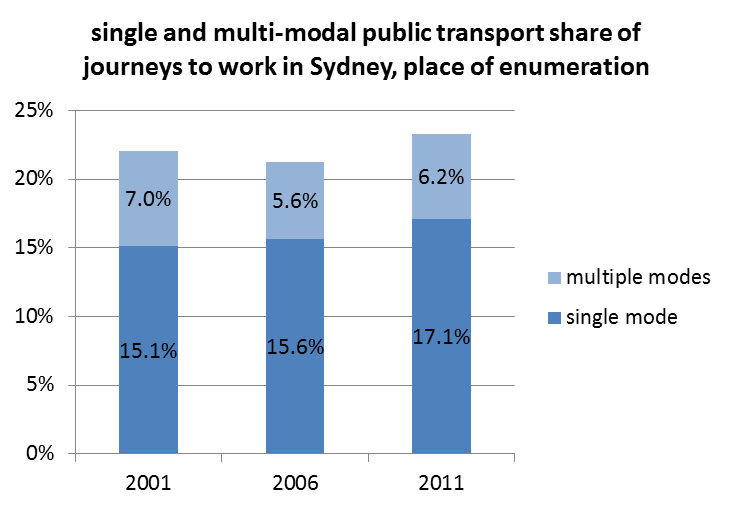 Sydney’s public transport mode share went backwards between 2001 and 2006, particularly for multi-modal public transport trips. There was a strong shift towards public transport between 2006 and 2011, with roughly equal growth in single mode and multi-mode public transport journeys. The data doesn’t tell us whether this represents a shift from single mode to multi-modal journeys (following the change to the fare system in April 2010). Here’s a map showing the overall mode share to public transport in Statistical Local Areas (SLAs), the smallest geography where data is available for both 2006 and 2011 (you’ll need to click to enlarge). The biggest mode shifts are in different locations when aggregated at the SLA level. The biggest shifts were in Hornsby south, Concord, Manly, Parramatta north west and Baulkham Hills. I suspect the large mode shift in Hornsby south is a result of the new train line connecting this area to the major employment areas around Macquarie Park. Campbelltown south was the only SLA to record a mode shift away from public transport. I cannot spot any significant shifts between 2006 and 2011. There were quite noticeable shifts to cycling in the inner south and around Manly. The total number of people cycling as part of their journey to workplaces in Sydney went from 12,128 in 2006 to 17,838 in 2011. Cycling’s mode share peaked at 21% in a pocket of Redfern between Telopea Street and Phillip Street, closely followed by a pocket of Dulwich Hill around Kintore Street at 20%. I’m sure other people will find more patterns in these maps – please comment on any interesting finds. This entry was posted on Sunday, November 25th, 2012 at 9:17 pm and is filed under Mode share, Mode shift, Sydney. You can follow any responses to this entry through the RSS 2.0 feed. You can leave a response, or trackback from your own site. Awesome Chris, and great blog! Shows significant increases around Castle Hill, as one would expect, and increases mostly across the board. I understand that this is not a recent post, but thank you for such an informative blog post. While area density due to shifts towards transport areas can be viewed negatively, I think it’s great that more people are forgoing the use of their car and taking up other modes of travel. Two years onward, the government are in talks of decreasing/eliminating parking spaces in new apartment blocks. This will mean cheaper housing and hopefully lower carbon emissions as well in a roundabout way. Perhaps they will put more money towards improving the train system too.